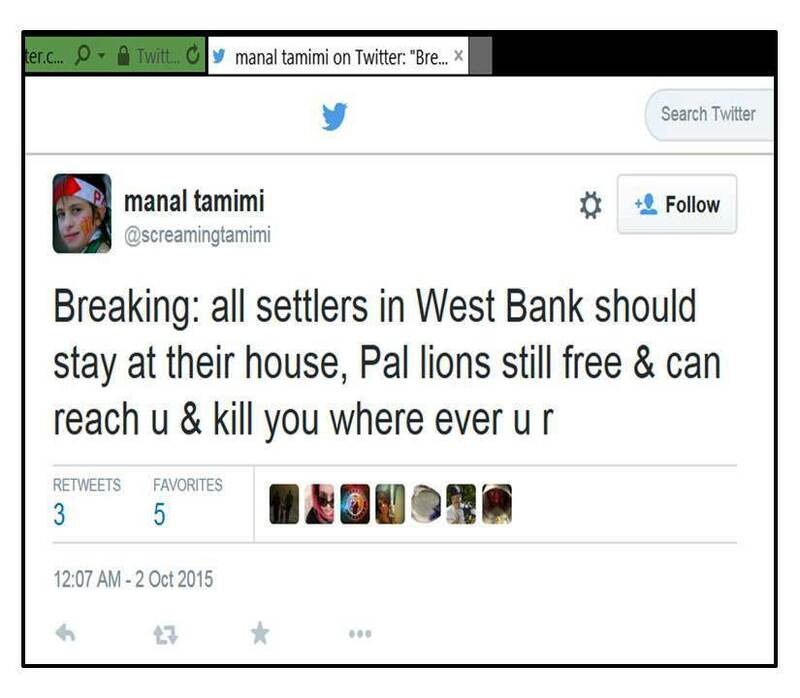 B’Tselem, i.e. The Israeli Information Center for Human Rights in the Occupied Territories, recently wrote about the proceedings against Ahed and Nariman Tamimi, claiming that they are unfairly prosecuted because “the Tamimi family has long since become a symbol of unarmed Palestinian resistance to the occupation.” Powerful human rights organizations like Amnesty International and Human Rights Watch have made similar claims, implying that “Palestinian resistance” deserves support. This stance requires these organizations to cynically ignore or whitewash the Tamimis’ longstanding and openly acknowledged support for terrorism. 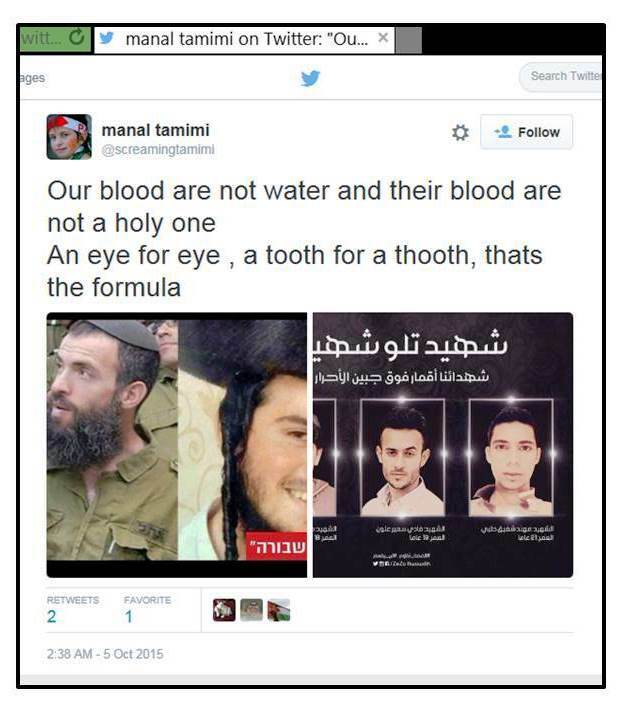 Since Nariman Tamimi can expect that most of her Facebook friends will know Ahlam Tamimi and share her appreciation of the murderous terrorist, some of the images were posted without comment (see e.g. 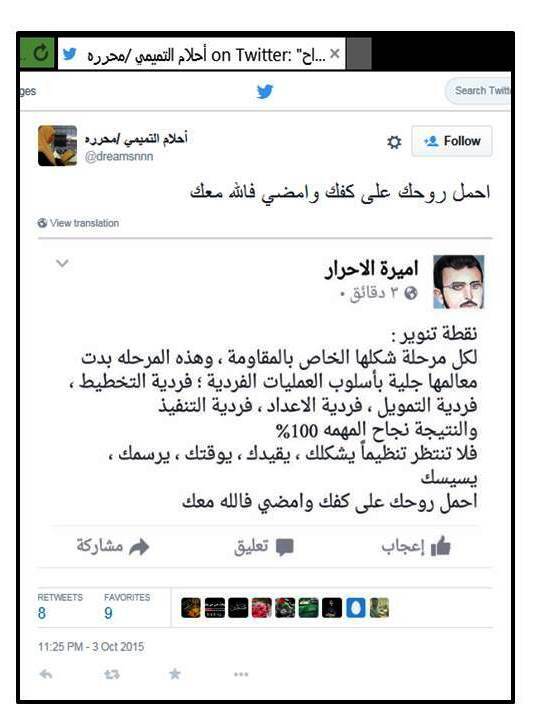 this example archived here; the archived copy displays the link to the original post on top). 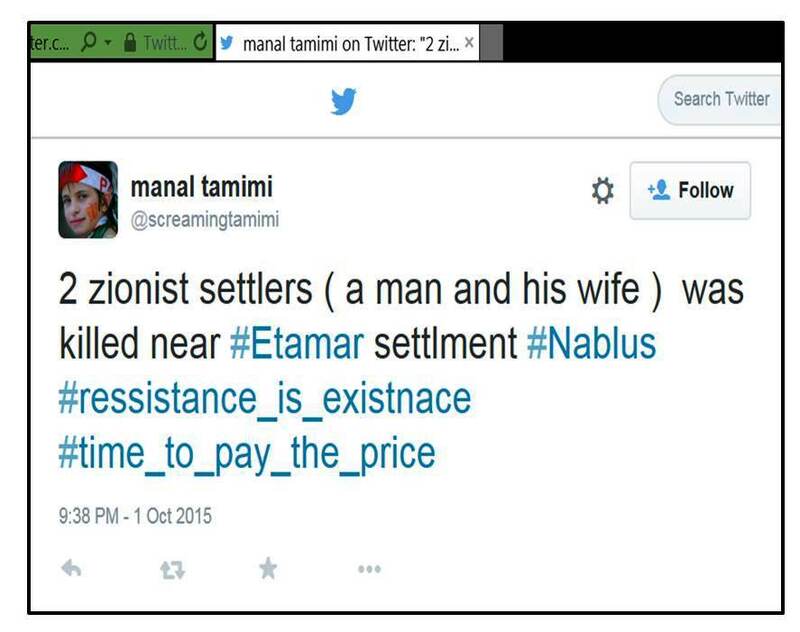 Another image posted by Nariman Tamimi on March 15, 2017, shows Ahlam Tamimi with her husband Nizar Tamimi, who is Bassem Tamimi’s nephew and one of the terrorists involved in the killing and burning of Haim Mizrahi in 1993; at the time, this terror attack was seen as an attempt to derail the Oslo peace process. Translations from Arabic courtesy of Ibn Boutros. Note: This is an updated version of a post first published in November on my TOI blog. “Child Sacrifice Brings No Honor to the Palestinian Cause” was the title of a recent Ha’aretz op-ed by Rabbi Eric H. Yoffie. It’s 2015, and one might have hoped there would be no need for an op-ed with such a title. But sadly, there is even a Wikipedia entry for “Child suicide bombers in the Israeli–Palestinian conflict,” and the recent stabbing attacks by Palestinian teenagers – including a boy as young as 11 – are only another reminder of the abusive indoctrination and exploitation of children practiced by Palestinian society for decades. More than three decades have passed since then, but Palestinians still believe that the same Israeli soldiers they regularly denounce as brutal and trigger-happy are “afraid” of children – which of course means they know full well that Israeli soldiers don’t want to shoot kids. Sadly, that in turn only means Palestinians find it very useful to involve their children in protests and violent provocations. The deeply cynical game that Palestinians like to play was illustrated a few months ago, when a video showing the attempt of an Israeli soldier to arrest a seemingly frightened boy for rock-throwing went viral. The fully armed soldier was quickly attacked and forced to retreat by a group of women and girls from the Tamimi clan of Nabi Saleh – a small village near Ramallah, which has become a popular destination for international activists who are attracted by the weekly efforts of the Tamimis to provoke clashes with the IDF. 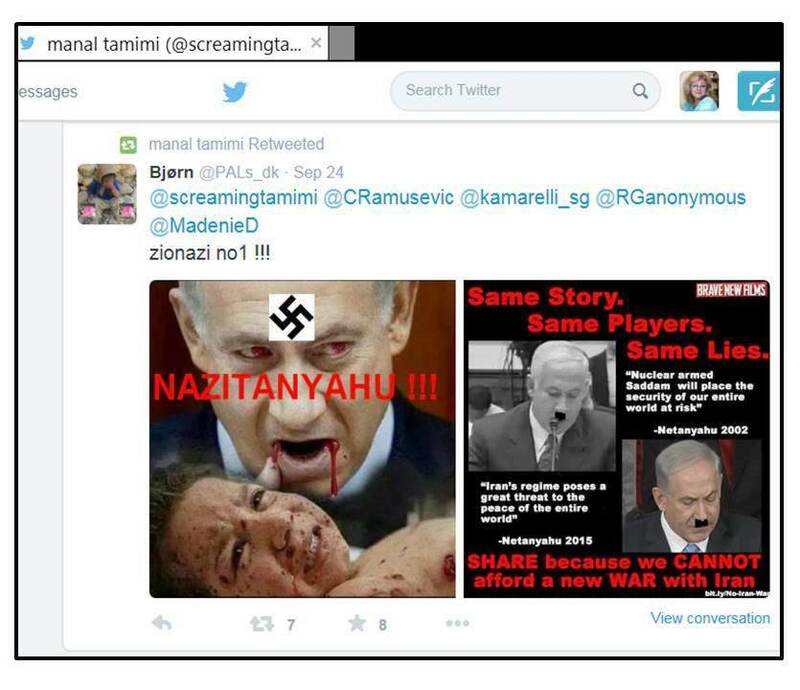 While the Tamimis gloat that it is child’s play to “shatter the myth of the Zionist army,” they also happily spread current versions of the medieval blood libel, including accusations that Israeli soldiers shoot Palestinian children for fun or arrest them to harvest their organs. It’s arguably worthwhile to ponder for a moment how it must feel to grow up in such an environment: on the one hand, your parents and adult family members push you relentlessly to provoke Israeli soldiers and praise you when you do so; on the other hand, your parents and adult family members say that the Israeli soldiers you are supposed to provoke kill kids for fun or arrest them to harvest their organs. 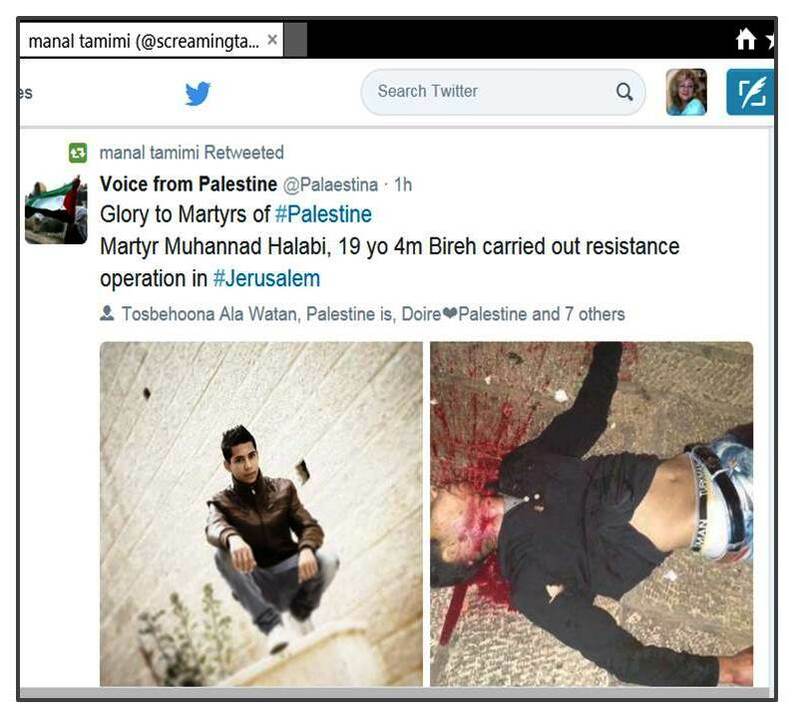 Add to this frightful demonization the pervasive glorification of terrorism in Palestinian society with the clear message that there is nothing more heroic than being killed while killing – or at least trying to kill – Israeli Jews, and it’s no longer such a mystery why even young Palestinian teens would grab a knife and go out to stab a Jew. 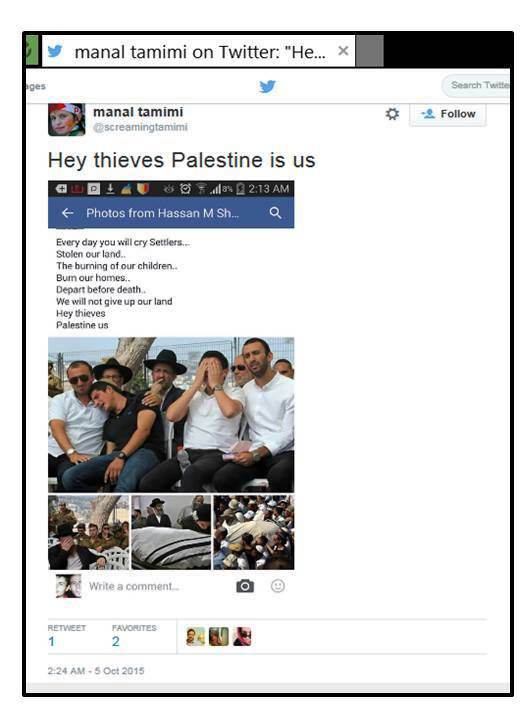 So it was no surprise that the Tamimis cheered the recent stabbing attacks – even when the attacks were thought to be carried out by 15-year-olds. 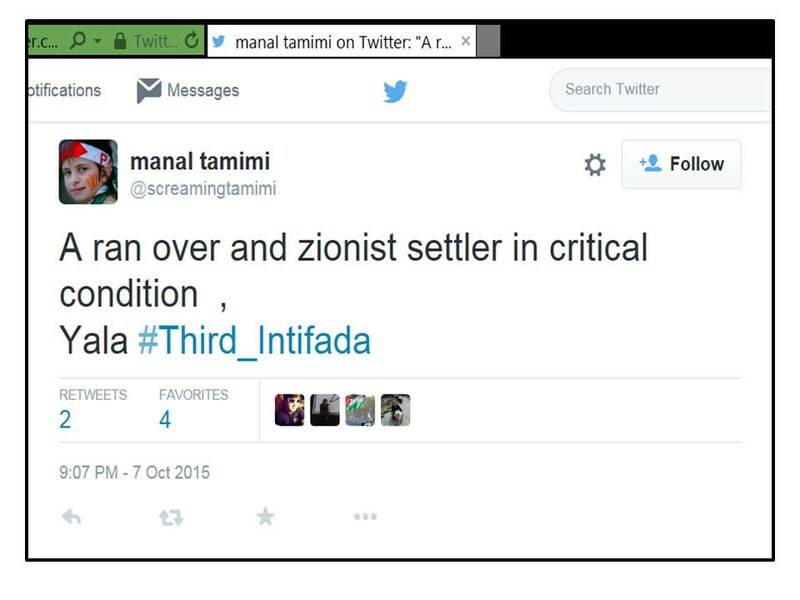 In this case, the attacker turned out to be actually 19, and the victim was a yeshiva student; but as I have shown in a detailed documentation published recently by The Tower Magazine, the Tamimis had been rooting for a “third intifada” for years and could see nothing wrong when it seemed that this long-hoped-for “third intifada” might be brought about by knife-wielding Palestinian teenagers stabbing Jews on the streets of Israel’s cities. 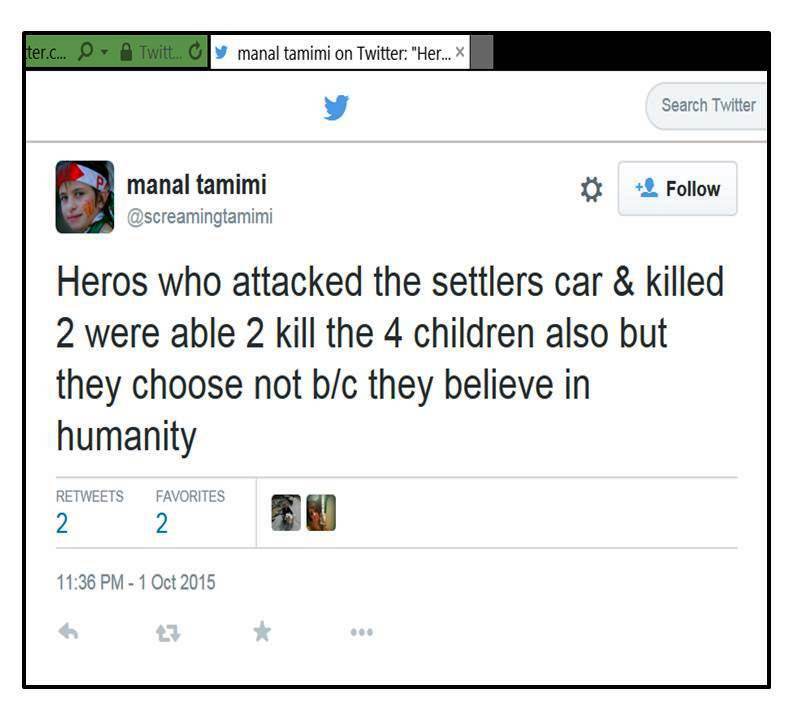 Since the Tamimis had long promoted the use of children in violent confrontations with the IDF, they were now ready to hail teenaged terrorists as “heroes” if they were arrested, and as “martyrs” if they were killed while killing or trying to kill; at the same time, they were shameless enough to claim repeatedly that the “martyrs” were innocent victims executed in cold blood by the evil Zionists. 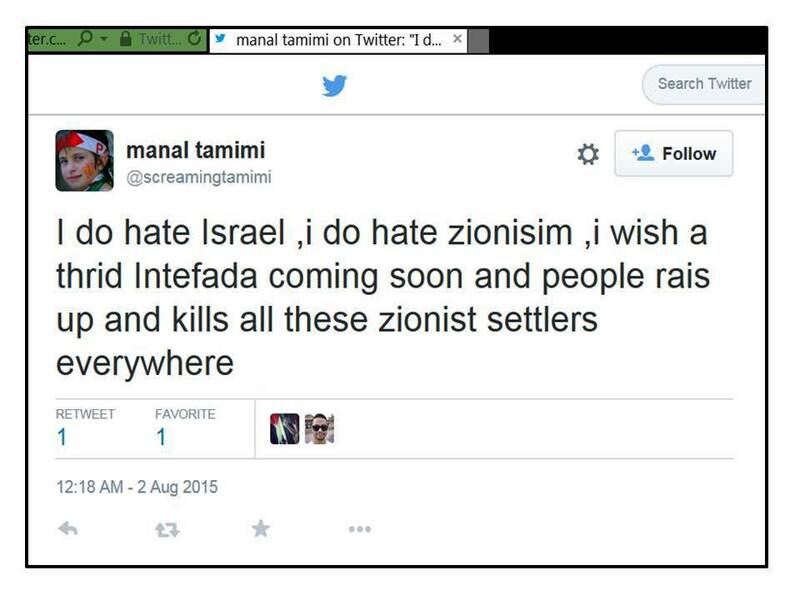 Sadly, the Tamimis are quite representative of mainstream Palestinian support for violence and terrorism, which is well-documented in surveys that go back more than two decades. It’s supposedly an African proverb that says “It takes a whole village to raise a child.” As I have shown in The Tower Magazine documentation, children in the Amnesty-supported village of Nabi Saleh are raised by adults who push them relentlessly to put themselves in danger in order to fulfill their “duty” to “resist;” the children see their parents cheer teenagers who went out to stab Jews, and they grow up among adults who feel that Israel’s Jews deserve to be killed because they are all bloodthirsty “settlers” and “Zionists” who want global strife. 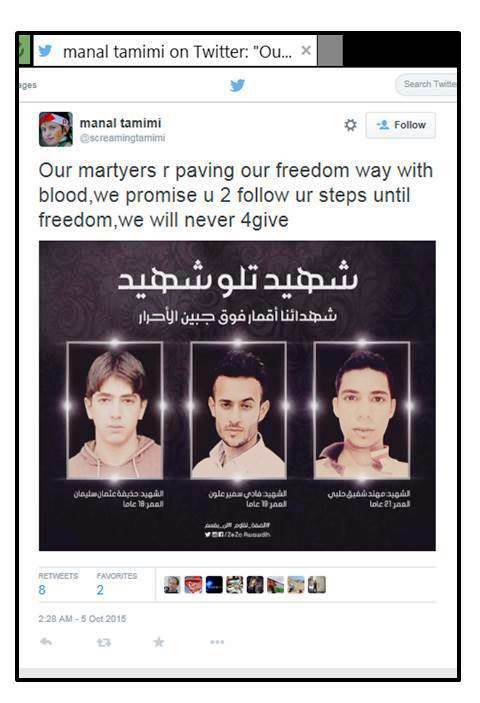 And as soon as the children are on Facebook, they will be “friends” with one of the most notorious Tamimi-clan members: Ahlam Tamimi, the mastermind of the 2001 Sbarro massacre in Jerusalem. About a month after The Tower Magazine published my documentation, Amnesty International decided to show again its support for the Tamimis and organized a campaign on Twitter that was joined by numerous regional and local Amnesty branches all posting tweets with the hashtag #NabiSaleh. However, a recent poll shows overwhelming support for the current wave of Palestinian terror attacks, though most do not want “young school girls” to commit stabbings. The children likely escaped death because one of the terrorists was injured by “friendly fire” and rushed to a local hospital by his accomplices. This and the following tweets refer to the lethal stabbing attack targeting a couple with two children returning from prayers at the Western Wall. 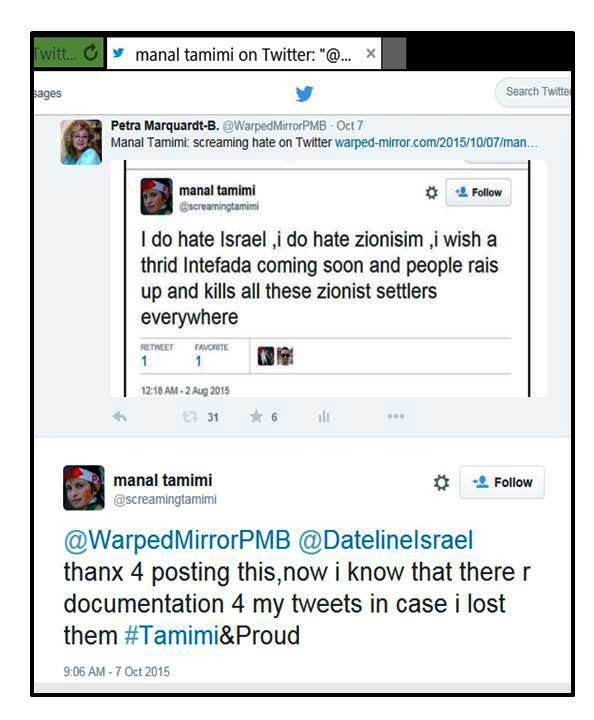 After my post was apparently brought to Manal Tamimi’s attention, she responded on Facebook and Twitter reaffirming her views. 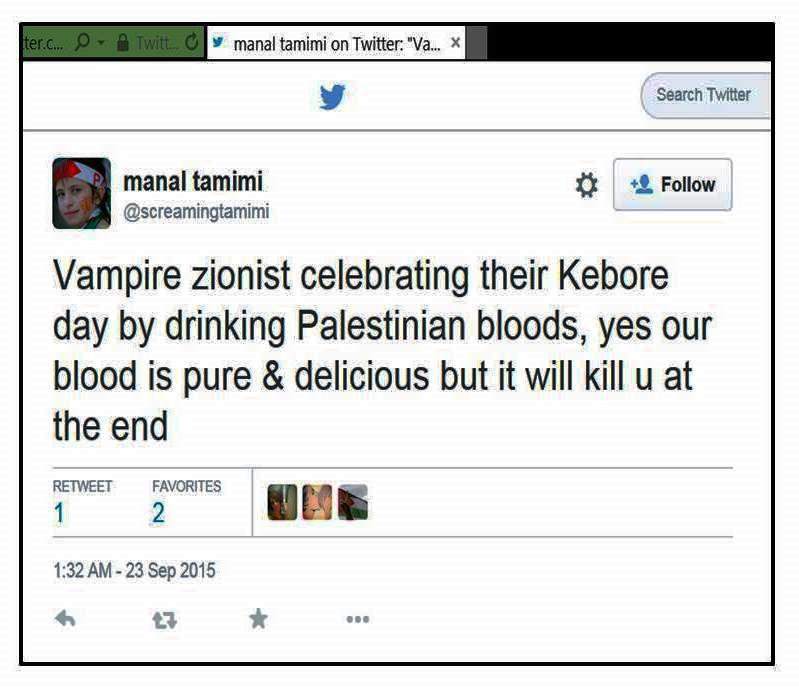 Later on, she also posted additional tweets expressing her hatred for Israel and her support of terrorist attacks and a “Third Intifada”. 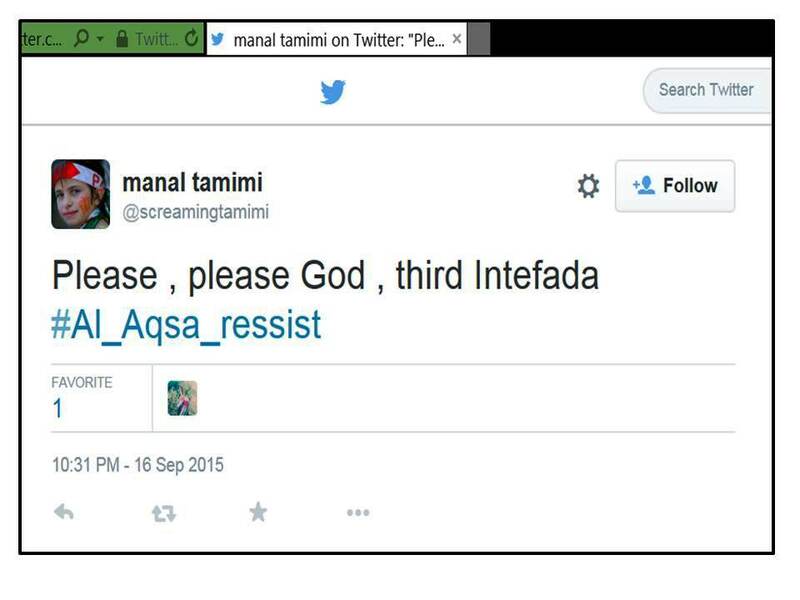 Does Amnesty International support Bassem Tamimi’s quest to start a “Third Intifada”? 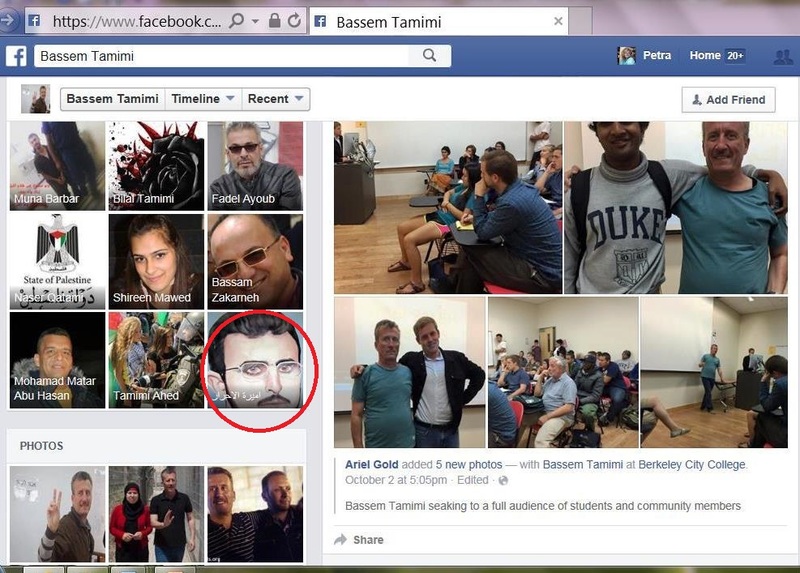 Given the fact that the perpetrator of tonight’s lethal terror attack in Jerusalem proclaimed in a Facebook post written a day before his attack that “[the] third intifada is here,” it seems worthwhile highlighting once again that Bassem Tamimi has consistently emphasized that he regards all forms of “resistance” as legitimate, and that his own (current) preference for protests and rock-throwing is a choice prompted by purely pragmatic considerations. 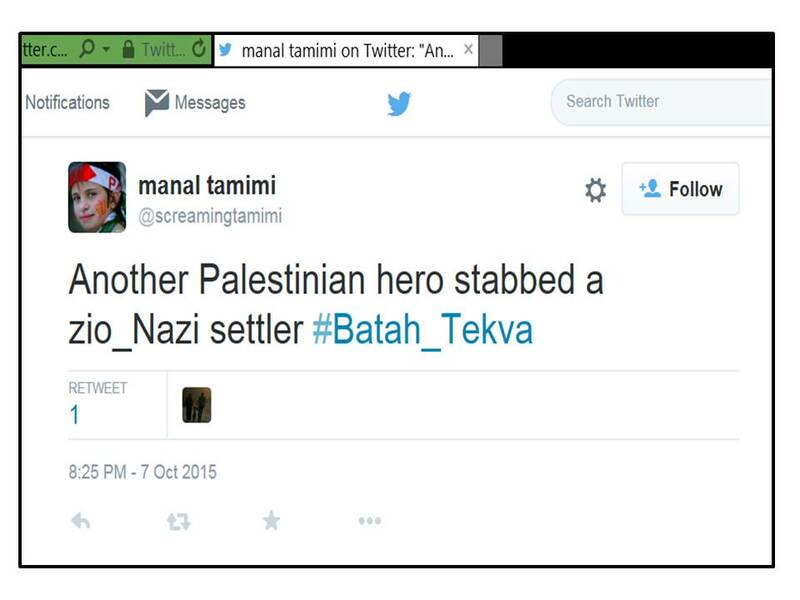 It is therefore not at all surprising to see the reactions of Bassem Tamimi’s family members and close collaborators to tonight’s terror attack. 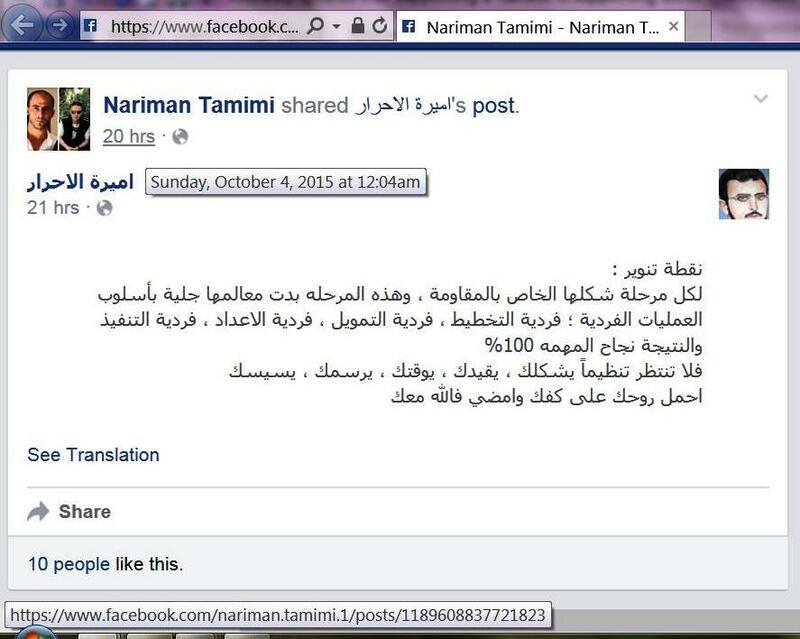 Bassem Tamimi’s wife Nariman shared a post praising the perpetrator as a “martyr” whose memory should be honored by only posting pictures of him alive and not any showing him shot after the attack. 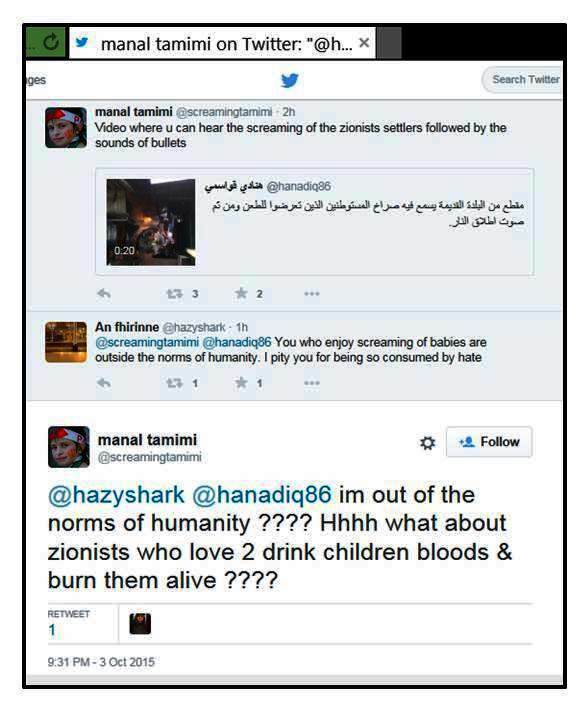 Meanwhile, Bassem and Nariman Tamimi’s relative and collaborator Manal Tamimi – who is, according to the New York Times Magazine, part of the “homegrown” Tamimi “media team” representing the Tamimis on Twitter – posted a series of tweets that left no doubt how the Tamimis feel about this and previous terror attacks; some other recent tweets illustrate their seething hatred for Israel and their deep-seated antisemitism. 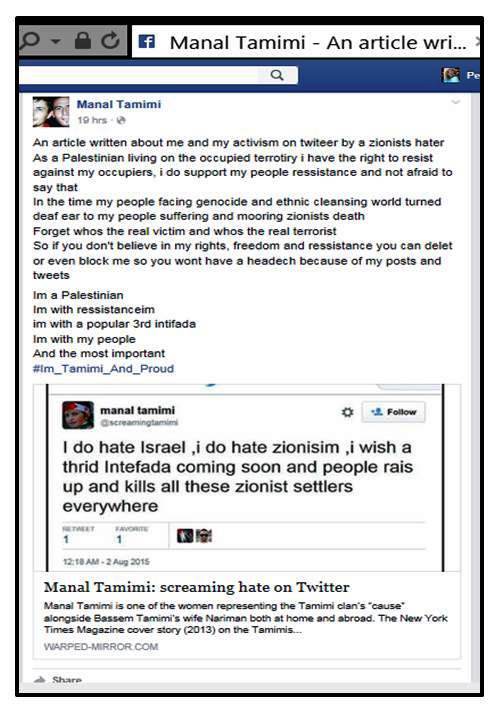 Below screenshots of some of Manal Tamimi’s recent tweets and a slightly revised version of my article from The Algemeiner. 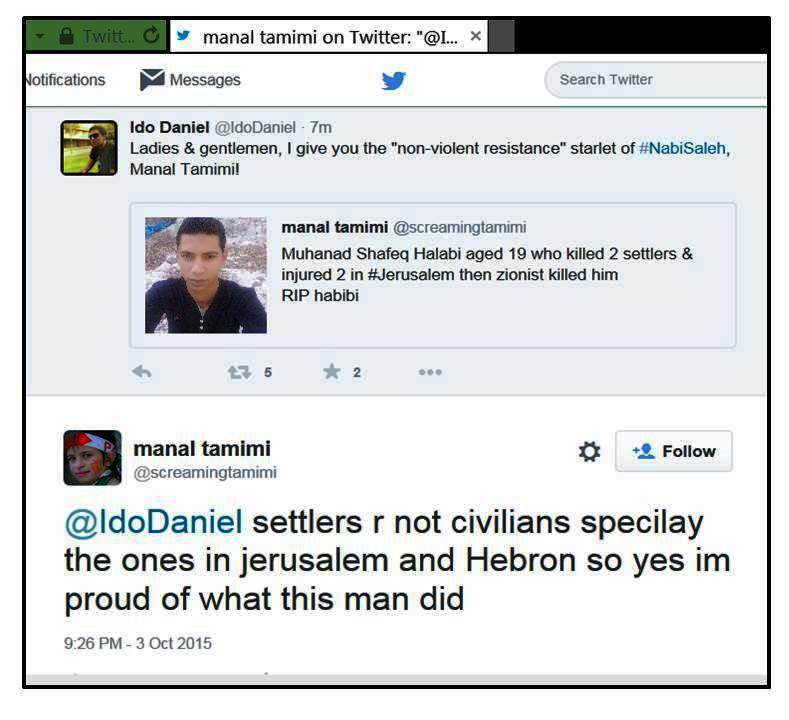 How would you like your children being taught about human rights by a veteran Palestinian activist who has pushed his own children for years to confront and provoke IDF soldiers in order to film the encounters? An activist who is only too happy to promote any dramatic footage he might get showing his own children terrified and crying if they successfully provoked a reaction? 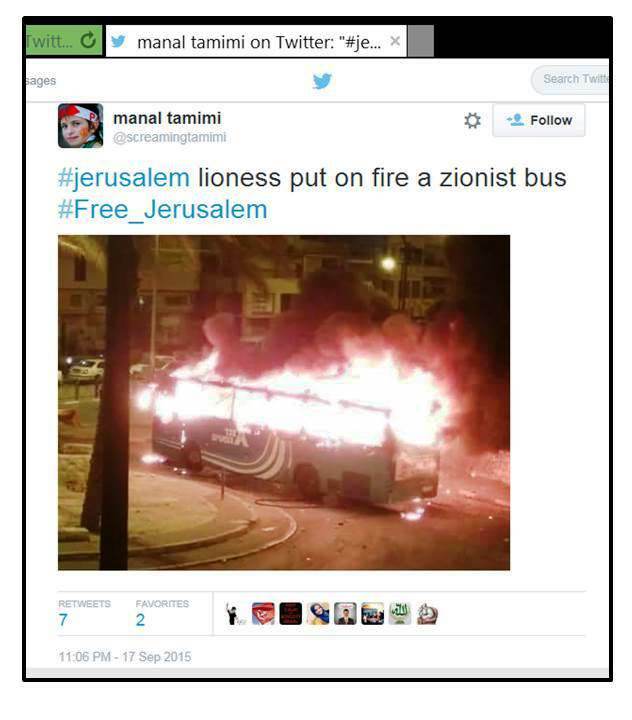 An activist who then celebrates the outpouring of global sympathy with his supporters by gloating that it is child’s play to “shatter the myth of the Zionist army”? 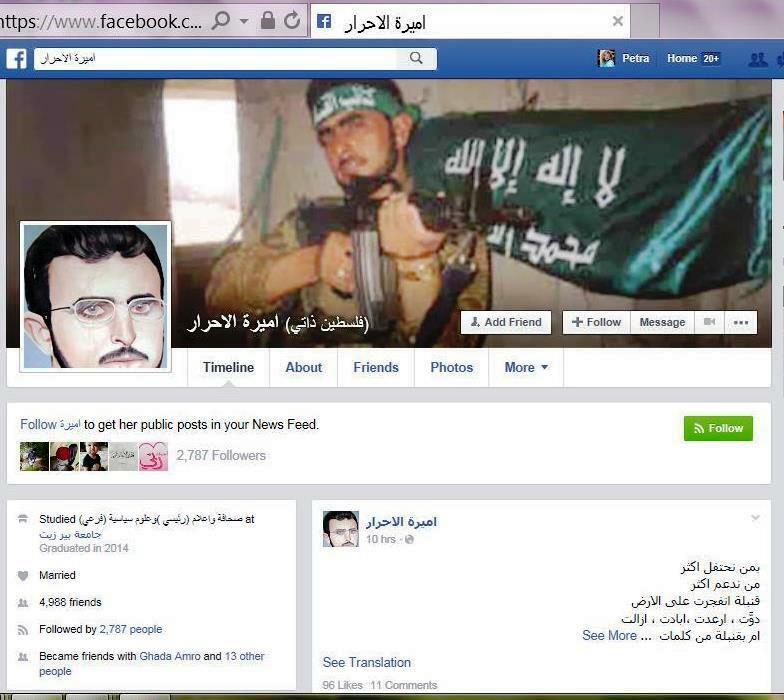 An activist who counts among his family members convicted murderers and terrorists, who endorses the promotion of the Hamas-affiliated Al Qassam Brigades on his daughter’s Facebook page, while his wife, the girl’s mother, glorifies the mastermind of the 2001 Sbarro pizzeria massacre in Jerusalem? 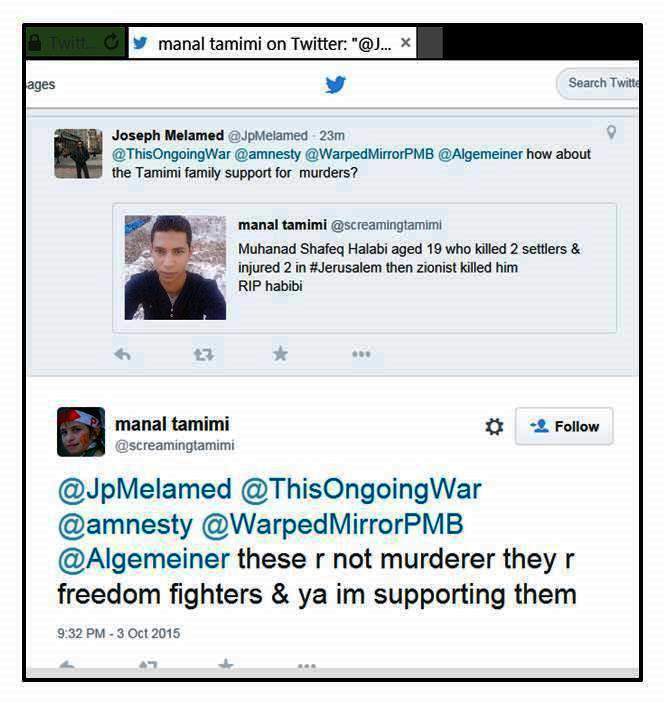 Indeed, Amnesty International is a co-sponsor of Bassem Tamimi’s month-long US speaking tour that included his visit at the Beverly J. Martin Elementary School in Ithaca, New York. 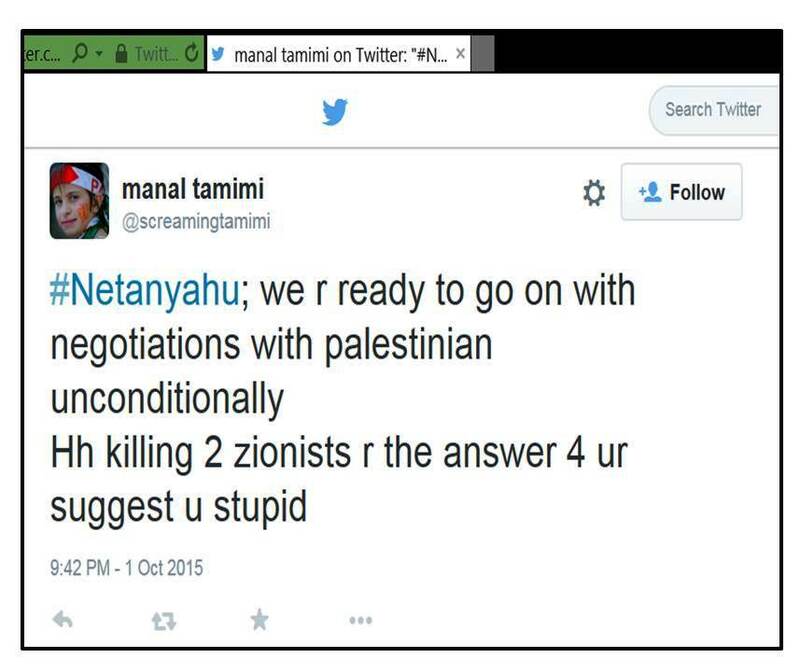 Apparently, Amnesty International is not bothered by the fact that the responsible Superintendent of Schools of the Ithaca (NY) City School District has acknowledged that the event with Tamimi was inappropriate. 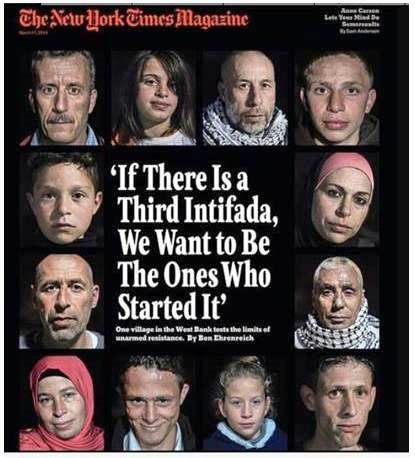 But what is clearly much worse is that Amnesty International is apparently neither bothered by Bassem Tamimi’s cynical exploitation of his children, nor by his openly stated determination to end Israel’s existence as a Jewish state or his thinly veiled support for terrorism. Amnesty might prefer not to have it spelled out, but promoting Bassem Tamimi as a “human rights defender” committed to non-violence is utterly disingenuous. Supporting Bassem Tamimi inevitably means supporting his openly declared ambition to start a “third intifada.” Tamimi likes to invoke the Palestinian “right to resist,” and he has made clear that this includes “armed resistance.” While Tamimi often explains in interviews that the “armed resistance” that made the second intifada (2000-2005) so bloody is in his view unlikely to lead to success, he also usually refuses to condemn terrorism, and he and other members of his clan reportedly resent “being asked to forswear bloodshed.” Indeed, those Tamimi family members who have shed the blood of Israeli Jews – including the unrepentant mastermind of the 2001 Sbarro pizzeria bombing in Jerusalem – “remain much-loved” in Tamimi’s village of Nabi Saleh. 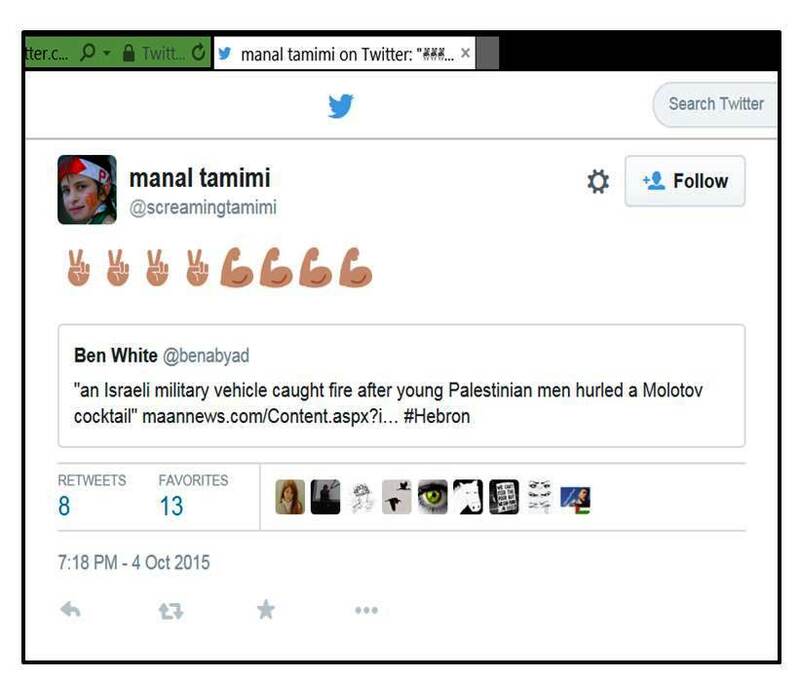 Moreover, there is obviously nothing “non-violent” about the throwing of stones and rocks that Bassem Tamimi promotes so passionately as “part” of Palestinian “culture” and as an integral feature of an “authentic” popular struggle. 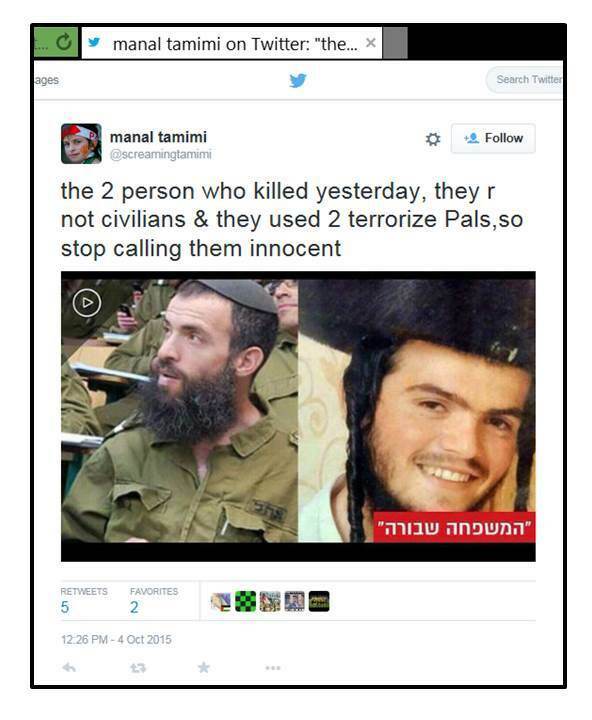 So far, 15 Israelis – including three Arabs mistaken for Jews – have been killed by Palestinian rock throwers. In this context it is also important to understand that the goal Bassem Tamimi pursues is not the peaceful co-existence of the Jewish State of Israel and an Arab-Muslim Palestinian state. In various interviews published on sites that oppose Israel’s existence as a Jewish state – such as the “hate-site” Mondoweiss and The Electronic Intifada (from where an interview conducted by the notorious Max Blumenthal was even cross-posted on the website of the Al-Qassam Brigades), Bassem Tamimi has indicated that he is a determined proponent of the so-called “one-state-solution” that would replace the world’s only Jewish state with yet another Arab-Muslim majority state. 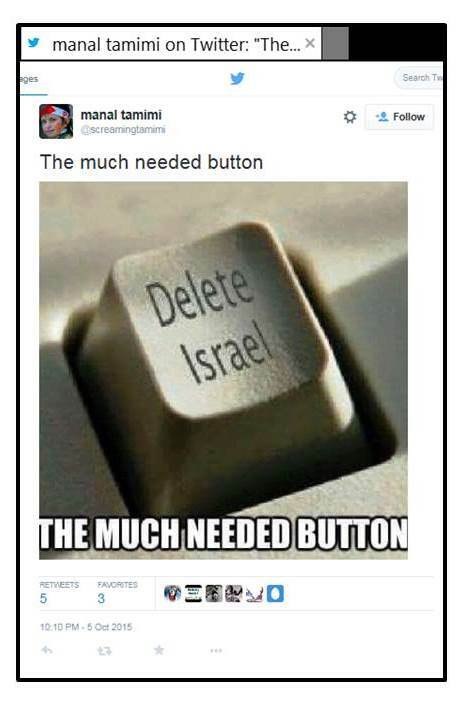 As the Jerusalem Post reported last week, an employee of Amnesty International in London has attracted much criticism for a tweet that, disguised as a joke, suggested that three Jewish members of the British parliament supported a massive bombing campaign of Gaza. While it is certainly welcome that Amnesty seems to be taking this incident serious, it is also clear that Benedict has a long record of rhetoric and conduct that reflects a deep hostility to Israel. Indeed, media reports on this incident note that “Benedict’s Twitter feed is a litany of [one-sided] criticism of Israel” and that there have been previous incidents that caused controversy and resulted in disciplinary action. 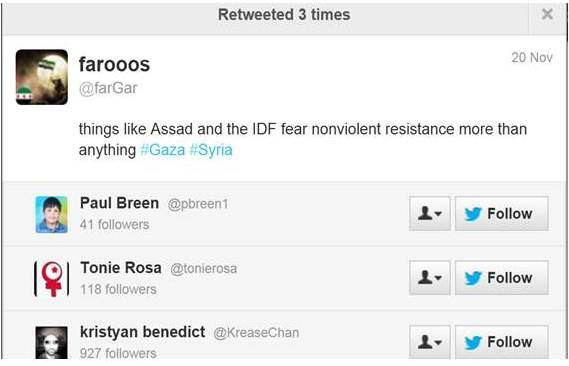 Benedict’s recent tweets offer a large choice of examples that illustrate his hostility to Israel, and his re-tweet of the view of an American-Syrian activist who claimed that “Assad and the IDF fear nonviolent resistance more than anything” on November 20 provides just one indication of this deep-seated resentment. 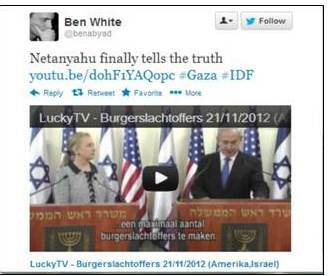 Unsurprisingly, Benedict also has a long record of organizing Amnesty events that provide a platform for anti-Israel activists like Ben White. One should imagine that it was inconceivable that Amnesty would repeatedly promote an activist who started his “career” by declaring that he could understand why some people are antisemitic and who has single-mindedly devoted all his adult life to delegitimizing Israel – an activity that most antisemites will enthusiastically applaud – but unfortunately, one would be wrong. Inevitably, Amnesty has often been criticized for the “ideological bias and double standards” that are all too often revealed in the organization’s work on Israel. Kristyan Benedict seems to have been doing his share to maintain Amnesty’s well-deserved reputation of a bias against Israel, and apparently, Amnesty sees no problem with employing a person who seems to believe that the world would be a better place if there was one Jewish state less. 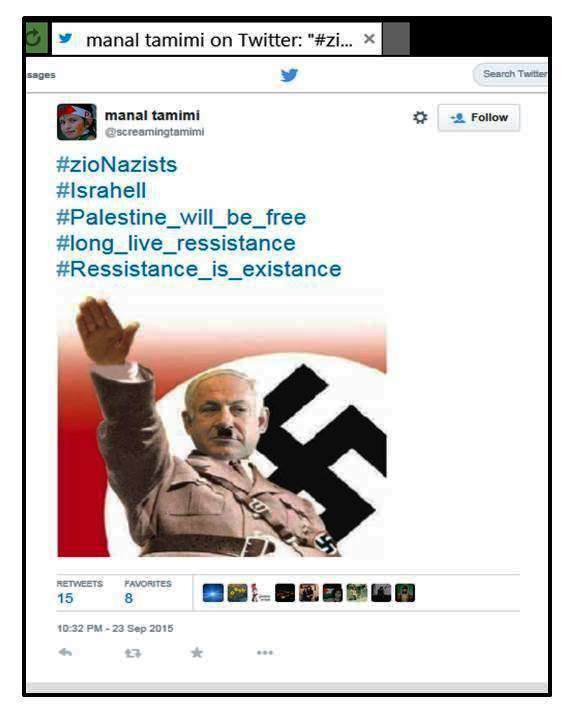 A study conducted a few years ago indicated that “anti-Israel sentiment consistently predicts the probability that an individual is anti-Semitic, with the likelihood of measured anti-Semitism increasing with the extent of anti-Israel sentiment observed.” Needless to say, there is a heated debate about related questions and, in particular, the overlap between anti-Zionism and antisemitism. 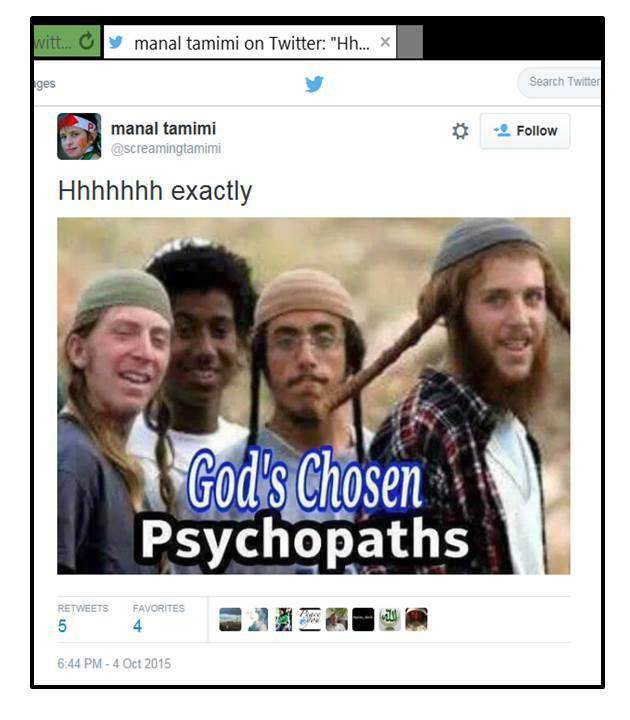 In other words, for Amnesty International staff member Kristyan Benedict, it’s OK when Jews identify as a religious group, but when they identify as a people – as Jews have since antiquity – and claim a right to self-determination and a right to self-defense, malicious ridicule and libel is in order. I think it’s fair to assume that Amnesty wouldn’t tolerate comparable views about the Palestinians whose sense of peoplehood is barely 100 years old. 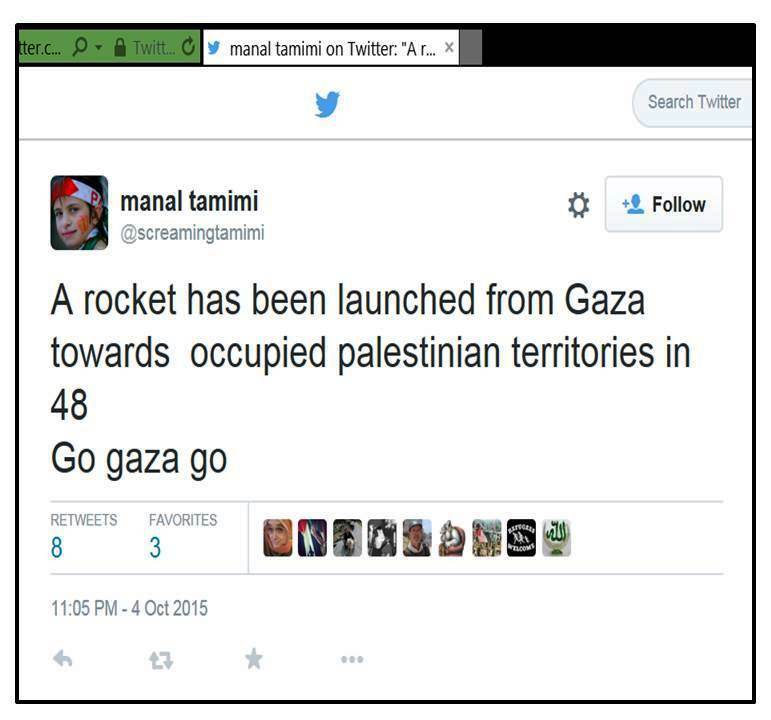 So far, 14 people have re-tweeted this tweet which, after all, fits nicely with the kind of anti-Israel propaganda White is relentlessly churning out — sometimes supported and promoted by Amnesty International. 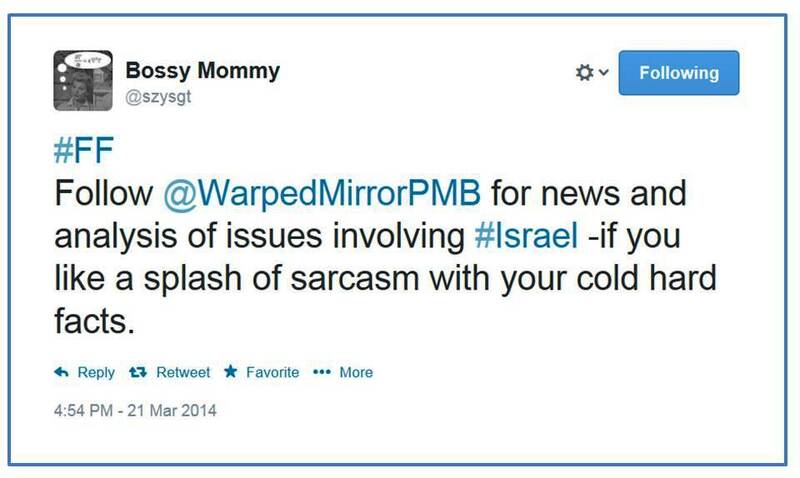 In response, I noted that he had not only failed to indicate in any way that he realized it was meant as a parody, but that the clip could actually be understood as a parody of himself and his supporters: after all, White has by now spent almost a decade frantically promoting Palestinian propaganda about supposed Israeli atrocities and the idea that Israel is evil incarnate. There is precious little difference between the image of Israel promoted by White and the tasteless “parody” broadcast on Dutch TV. Unsurprisingly, the only response White could think of was to block me from following his Twitter account – which I hadn’t followed anyway.